The dragon dagger pipe is about 4 inches long. The stunning art of this pipe is in the middle of two layers of glass. It has little cuts on the side that increases the beauty of the piece. 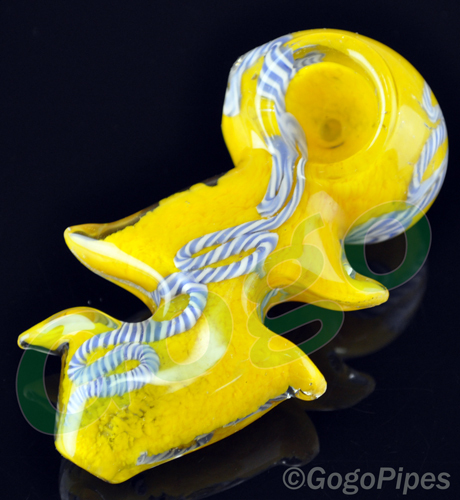 we try to send the best product possible, Secure online shopping at GogoPipes.com. More details are given below. Pros: Neat design . Looks better in person . My carb was on the left so I guess they have made that correction since other reviews say it was on the right side. Pros: This piece is great, hits very hard, gets me so geeked. Pros: Very fast shipping, good price, nice pipe. Pros: Beautiful pipe hits great love the colors and the little marble things on it. Extremely thick glass definately worth the price. Cons: The bowl was much bigger than expected and I was really hoping the carb would be on the left side of the pipe. Comments: Love this pipe, I will definately be buying from gogo again! Pros: thick glass, beautiful looks, pulls wonderfully. Cons: not a con really but bowl was much bigger than expected. Comments: this was my first purchase at gogopipes and it was the best piece purchase i have ever made online. shipping was more than fast enough via regular USPS (there are faster shipping options for more $) and was packaged well.